Oh no. Already? It’s the ice cream truck, with its endless, scratchy loop of a song my dad used to sing to us when we were little. Of course there are no words—the truck just blares the melody out on its tinny loudspeaker. Over and over again. All day. But I can’t stop the words from running through my head. And I handed the lady a five-cent piece. We get a brief respite from the song as the truck backs up to turn around. BEEP! BEEP! BEEP! Then it picks up where it left off. People often ask about seasickness, but they never ask about landsickness, which is almost as bad. After three months on the boat, our bodies are completely used to the constant motion, we adjust to every little roll without even thinking about it. We can carry a cup of hot coffee up to the cockpit and never spill a drop. Well, except when the going gets really rough. So the stillness of being up on stands in the boat yard is hard to get used to. It makes us feel dizzy and confused. As does the frenetic pace of life on land. Our first day on the hard was a nightmare. As soon as the boat was out of the travel lift, we had to drive to U.S. Customs and Border Protection in Port Canaveral to clear in. Cars and trucks whizzed by us on the interstate at impossibly high speeds. “Here! Get off here!” I said, too late. We’d missed the exit. We never miss our exit in the boat. My head was spinning by the time we reached customs. I had to sit down while Chris waited patiently for the armed officer to decide to admit us to the country. He kept disappearing to do checks. Or have his lunch. We weren’t sure which. Then we made the mistake of trying to do too many errands. We went to the bank, and the hardware store. By the time we got to the grocery store I just wanted to cry. We grabbed a couple of things and headed back to the boat. A good night’s sleep, I thought. That’s all I need. But I didn’t get it. The bed was eerily still. I kept waking and listening for a change in the wind, wondering if the tide had turned us yet, if the anchor had held. Then I couldn’t get back to sleep. So many sirens in Titusville. It must be the calamity capital of Florida. And cars. There’s a highway outside the boat yard gate, and all night, cars would race by, a sudden blare of music, then gone. And then there are the trains. There’s a major railway track maybe half a kilometre away, and through the night, long freight trains come through. You can hear their whistle in the distance, then closer, then a low rumble, then louder. The boat actually shakes on its stands as the train passes by. Like seasickness, landsickness only lasts a few days. We’re pretty much used to all the activity and the noise now. Well, maybe not the noise. Oh no! It’s the ice cream truck again! And she said,” This money is no good to me. Chris and I figured we’d pretty much have the boat to ourselves for a couple of days when we set off from the Bahamas. We’d been watching the weather for a week, finally saw a window to make the crossing to Florida. So even though it was pouring rain, we slipped our dock lines and set out. “Nice,” Chris commented, as the rain pelted down. But the wind was behind us, just as predicted, so we put out the jib (which we can do from inside the cockpit, thankfully) and we were on our way, holding about five knots, which for us, is pretty good. Five hours later the rain started to let up little, then finally stopped. We unzipped the wind screen to get a good look at the clouds, and to our surprise, a big bird swooped out of the sky and made straight for our bow. “What’s he doing?” I asked Chris. Sure enough, the bird hovered over our anchor for a minute then settled onto the curved bar of steel which keeps our mighty Rocna from setting—or not setting—upside down. A perfect perch for a bird. Or it would be for a bird without webbed feet. “What is that?” Chris asked. I was at a loss. I’d never seen anything quite like it. It was a big bird, almost two feet tall, dark brown with a lighter brown belly, a long, sharp beak. And bright yellow webbed feet. I kept expecting him to fall off as he teetered there, the boat rolling in seas that were building as we left the shelter of the Berry Islands and entered the Northwest Providence Channel. But he was unconcerned by the motion, settled into preening. And preening. And preening. With his long beak, he could reach the end of his tail, no problem. How can he hang on with those feet, I wondered. Then he stood on one foot and scratched the back of his head with the other. Oh. Only later was I able to look him up online and determine that he was an immature brown booby. These birds are widespread in the waters off Florida and “commute” and forage at low heights all seasons of the year. This one gave a whole new meaning to “commute.” When he’d finished preening, I thought he’d fly off, but instead he sat there, looking around. He was fascinated by the jib, watched it closely. What I couldn’t do with wings like that, he may have been thinking, or, two points to starboard and you’ll get much better lift. Surely he’ll leave at dusk, I thought, but as darkness fell, we were too busy paying attention to all the ships heading in and out of Freeport to keep an eye on him. And it was overcast and dark all night. We could hardly see the sails, never mind something perched on the bow. I was on watch when the sun began to rise the next morning, and I couldn’t wait to see if he was still with us. No, I thought, then maybe. As it got lighter, I could make out something on the anchor, but it wasn’t the same shape as our bird. It looked much fatter, and it didn’t have a head. Then I realized that he was sleeping, with his head tucked under his wing, fluffed up against the cold night air. He woke when the sun reached him, looked around, preened a little more, spread his wings wide—I mean really wide: he had a wingspan of at least three feet. And then he just stepped off the anchor and skimmed away over the water. Where am I, I imagined him thinking. What am I doing here? I’ll admit that I sometimes wonder the same thing. “We’d better go now,” Chris says. I still haven’t finished my coffee but I have to agree with him. There are dark clouds gathering out to sea and they’re coming our way. We have to get our guests to shore before this squall hits or they’ll be soaking wet on the plane ride home. 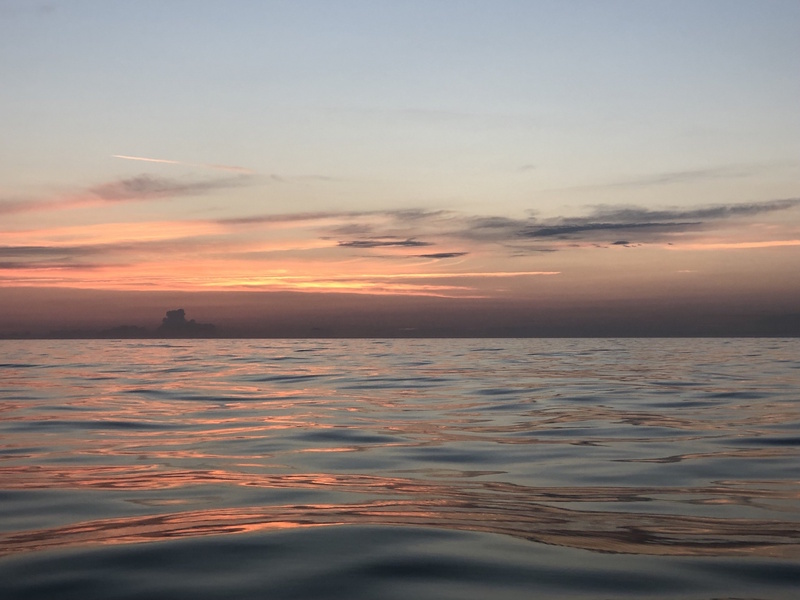 We are anchored just off Georgetown, commonly known as “Chicken Harbor.” Beyond Georgetown lies open ocean and with little between you and Africa, there is plenty of room for the seas to build. Pounding into 12-foot waves with 20-knot trade winds on the nose is not unusual. Some sailors make it as far as the Dominican Republic or even Puerto Rico before turning back, their sails in tatters, the crew ready to mutiny. But many never find the courage to leave Georgetown. Which is why, at night, the harbour is a sea of mast lights. New York City, we call it. It’s kind of pretty. From a distance. We are anchored about as far west as you can go, far from the madding crowd. On calm days, the bubbly pools on the ocean side are a great place to play. Which is why we need to move the boat closer to Georgetown to disembark our guests and their luggage. Even if the squall missed us, they’d be soaking wet after the long dinghy ride to shore. We motor to Georgetown and drop anchor as close to shore as we can, then a quick flurry of good-byes and Chris zooms to shore, the dinghy piled high with people and suitcases and two water jugs he’s decided to fill while on shore. The dark clouds keep coming. I keep watching for him to return. The sky darkens, the wind picks up. I keep watching for him to return. 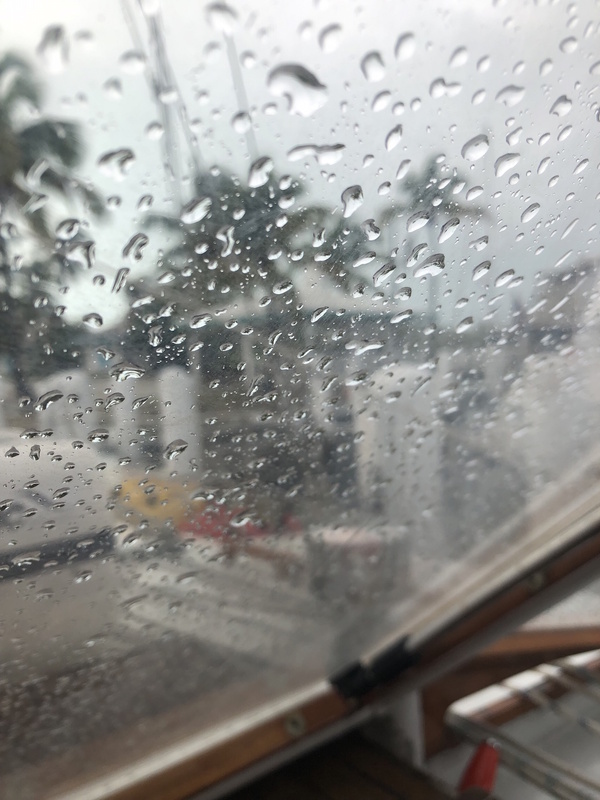 I try not to think about the squall that hit us just after we dropped anchor in Lake Worth last year. The boat heeled over so far the port rail was in the water, and we had to motor ahead at full throttle just to keep our anchor from popping up. Could I do that? A dinghy leaves shore, heads towards the boat. Thanks goodness. I stop cursing him in my head and go to the aft deck to take his line. It’s not him. I call him on the handheld radio. No answer. I close all the hatches, lock the cupboards. Finally he calls on the radio. “Have you looked at the sky,” I ask him, incredulous. The first drops of rain splatter on the windscreen. And the wind is picking up. I curse him out loud now. I’m raving, actually. How could he be so cavalier? Twenty minutes later I see him set off from shore. There are no other dinghys on the water. So maybe I’m a big chicken. It was nothing. The squall hit us just as Chris climbed on board, the anchor held, it was all fine. Half an hour later we were motoring back to the anchorage under sunny skies. I do understand why people are tempted to stay here all winter—many do, in fact. The beach on the ocean side goes on forever—despite our best efforts, we’ve never walked the whole length of it. 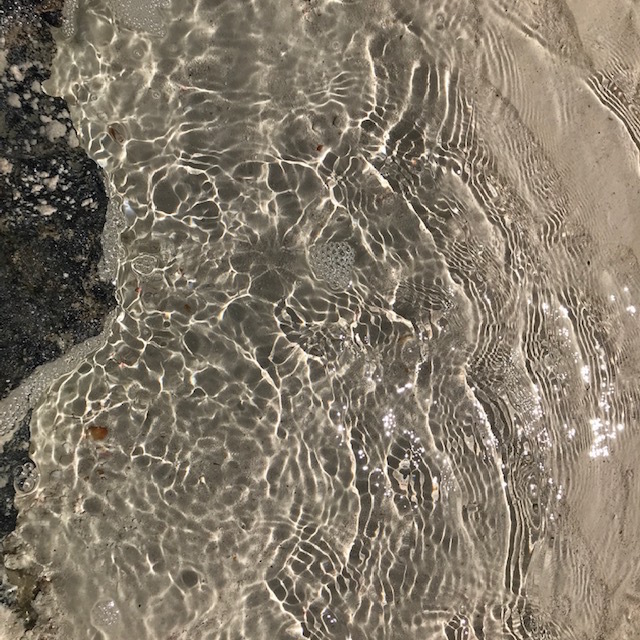 We get distracted by big surf, pretty shells, tidal flats, bubbly pools. And the beaches on the west of the island are just what you imagine when you dream of being cast off on a desert island. 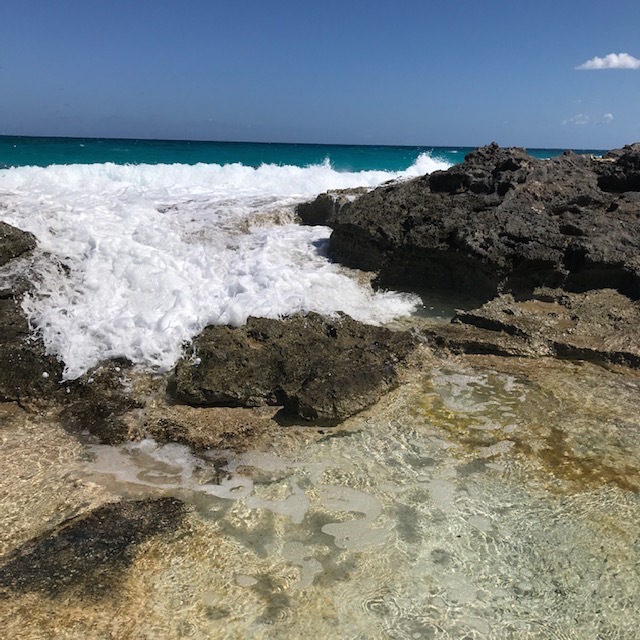 The swimming is perfect, the water here is warm and clear—so clear you can watch starfish making their slow way across the bottom. Free water, a grocery store, a liquor store. What else do you need in life? Sadly, it’s time for us to start the long journey home. We need to start heading north if we’re going to make it to Ontario in May. So reluctantly, we’re leaving this piece of paradise. With full water tanks, fresh produce, and a freezer full of chicken. I’ve been trying a lot of new things lately, now that I have a book to promote. I’ve set up an Instagram account called lindakenyonauthor, which is actually a lot of fun. I’ve taught myself to take square pictures and post them there. If you can’t wait for the next blog post to see what we’re up to, you might want to follow me on Instagram. I’ve also put together a professional Facebook page called Linda Kenyon, Author where I post book-related news. And I’m now a Goodreads author. All very exciting. I invite you to follow and maybe even like me on any or all of these online platforms. But this Friday, I’m trying something really exciting. Or daunting, depending on your perspective. 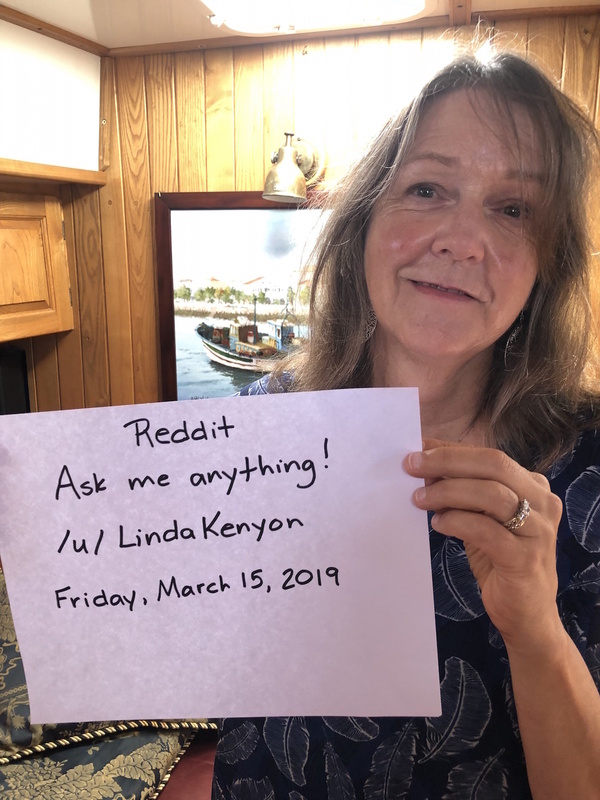 I’m hosting an Ask Me Anything session on Reddit. Now I hadn’t even heard of Reddit until Digiwriting, the publicity firm I’m working with, suggested that I take a look at it. It’s a massive online community where people from all over the world share and discuss absolutely everything. Tomorrow, from 11am to 1pm EST you (and anyone else in the world) can sign in and ask me, well, anything—about what it’s like in the middle of the ocean, about finding the courage to start again when your life doesn’t go quite as expected, about writing a book—anything. I’ve read through the transcripts of previous Ask Me Anything sessions and realize that as a Canadian, I must be prepared to answer questions about poutine. But I’m hoping for more interesting questions, too. Please feel free to listen in or indeed ask your own questions. To participate you’ll need to make a Reddit account then access the r/books: https://www.reddit.com/r/books/ page between 11am and 1pm EST on Friday March 15th, 2019. And I’d welcome any advice you may have on how to explain poutine. We’re anchored in the harbour at Black Point Settlement in the Bahamas, stretched out in the cockpit, enjoying a glass of wine with our friends, when we see that thing a sailor never wants to see: the red and green running lights of a big boat, which means it’s coming straight towards us. We’re directly in its path. So are a dozen other boats. But as we watch nervously, the boat expertly weaves its way through the anchorage to the dock, missing even the boats who have forgotten to put their anchor light on. Clearly they’ve done this before. Which means… it’s the supply boat! We had intended to reprovision in Georgetown before Rick and Sally came on board, but as you may remember from our last post, we never got there. So pickings have been a little slim since they arrived. We’ve been eating a lot of rice. And onions. And more rice. And sharing the last two lamb chops. So all of us are pretty excited to see the supply boat. We’re up early the next morning and dinghy to shore, shopping bags in hand, but they’ve just started unloading the ship. We watch as box after bundle after bucket are hand-bombed over the side. Then the heavy lifting begins. A huge crane unloads skids of goods—cases of beer, building materials, 40-gallon drums. Of what? Tar? Oil? Not gasoline, I think. I hope. We give the shopkeepers a little time to unpack their goods before making the rounds. We walk up to Rockside Laundry as much to admire the view of the harbour as to pick up fresh eggs and milk and butter, which they always seem to have. On the way back, we stop at Lorraine’s mother’s house to get a loaf of coconut bread fresh from the oven. Well, maybe two. Then we stop at Adderley’s Friendly Store (who can resist a friendly store?) and the tiny store across the street from it, which doesn’t have a name, as far as we can tell, but is just as friendly. Now when you think store, don’t think Sobey’s or Longo’s. Think corner store. 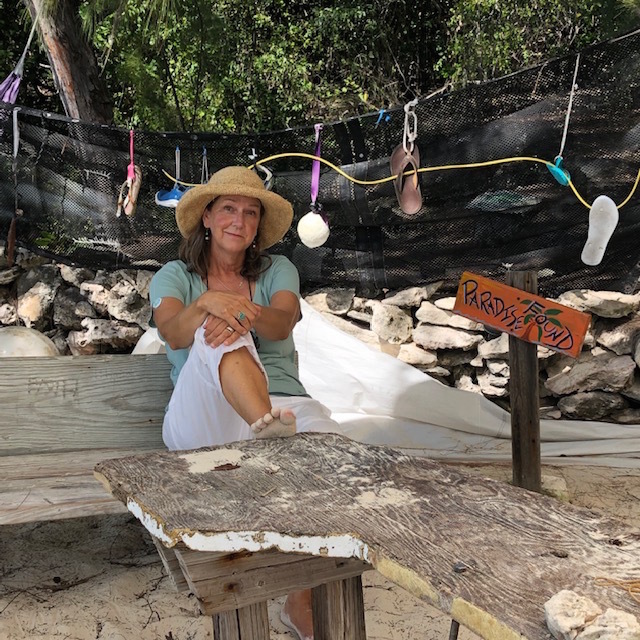 Often as not, a store in the Bahamas is the front room of someone’s house—or in the case of Lorraine’s mother, the back door: you just knock on the kitchen door and walk in. They’re tiny, and they don’t have a lot of stock, canned goods for the most part, some essential toiletries, some meat in a chest freezer—you just open it up and rummage at will. When the boat comes in, boxes of produce appear—oranges, plantain, cabbages, onions—and disappear almost as quickly. Then it’s back to cans. Once we have as much as we can carry, we head back to the boat and make French toast with coconut bread—a real treat when drizzled with the Ontario maple syrup Rick and Sally brought with them. Things are looking up here on the good ship MonArk. We’re having mystery meat tonight (we’ll find out what it is when it thaws), fried plantain, and broccoli for dinner. No more rice and onions for at least a week now. We left ourselves ten days to get from Eluthera to Georgetown, a distance of 80 miles as the crow flies, considerably further as the boat sails. Now here’s the thing about a sailboat—you can’t sail directly into the wind. Some boats can get pretty close to the wind. But not our boat. Twenty tons of steel, remember? 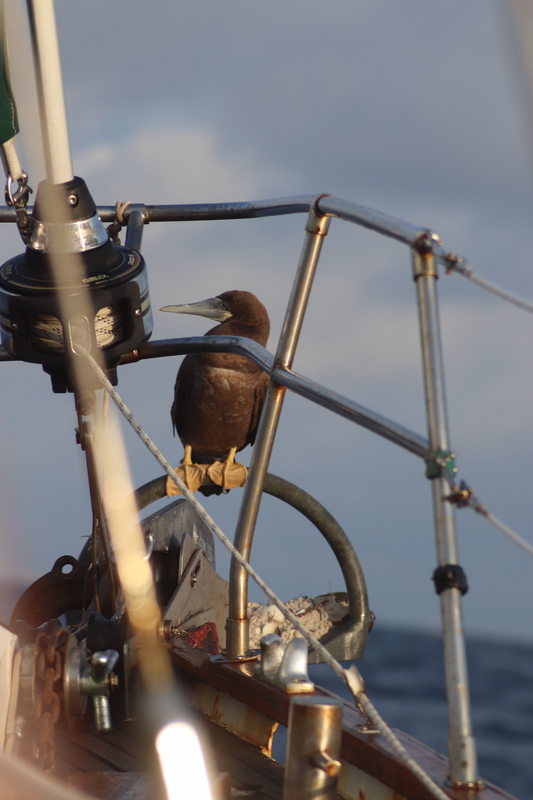 The trade winds were just setting in on the first leg, southwest from Eluthera across the Exuma Sound. Deep blue water, over 5,000 feet in the middle of the sound, sunshine, a brisk southeast wind. Perfect. We passed a sport fishing boat bobbing in the deep water. “Look,” a man shouted. He held up a four-foot tuna, grinning. The man, not the fish. Chris immediately put out our line, and within minutes something big seized his new red plastic squid. Then ran off with it. “My new squid!! !” Chris put out his second-best squid, but we didn’t have another nibble the whole way across. 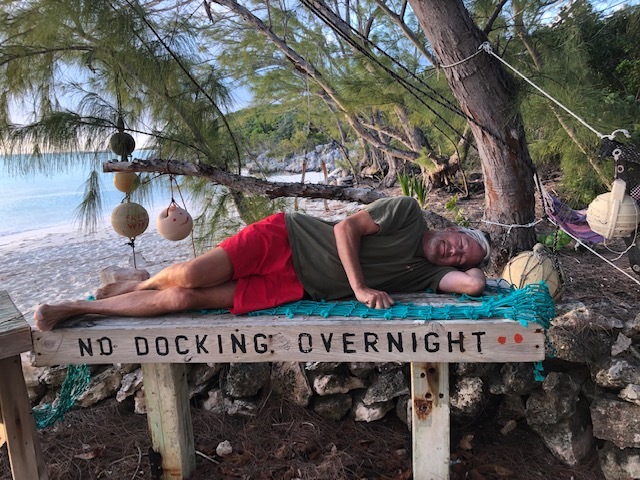 We made landfall at Highbourne Cay, got a good night’s sleep, then turned our bow… southeast. Right into the wind, which had built overnight and kept building. By midday we were pounding into steep choppy waves, salt spray drenching the boat, flying in through the cockpit windows from time to time. We tacked our way into Hawksbill Cay, a shallow anchorage far from shore but more or less sheltered from the southeast. The next day was no better. The winds, if anything, were building. The trade winds had well and truly set in. We turned and ran north. With the wind at our back, it was a beautiful downwind sail. We decided to carry on past Hawksbill to Shroud Cay, which has slightly better protection from the south. Distance made good, minus three miles, I wrote in the log book. We didn’t even try the next day. We watched what was going on out on the banks—lots of boats heading north; only a foolhardy few heading south, hobbyhorsing wildly through the whitecaps. Instead we explored the coast of the uninhabited island in our dinghy, found a huge ray loafing in a pool on the tidal flats, discovered some very strange mud mounds—who lives here, I wondered, stepping carefully around them. I didn’t really want to find out. A couple days later, we tried again. Same thing. 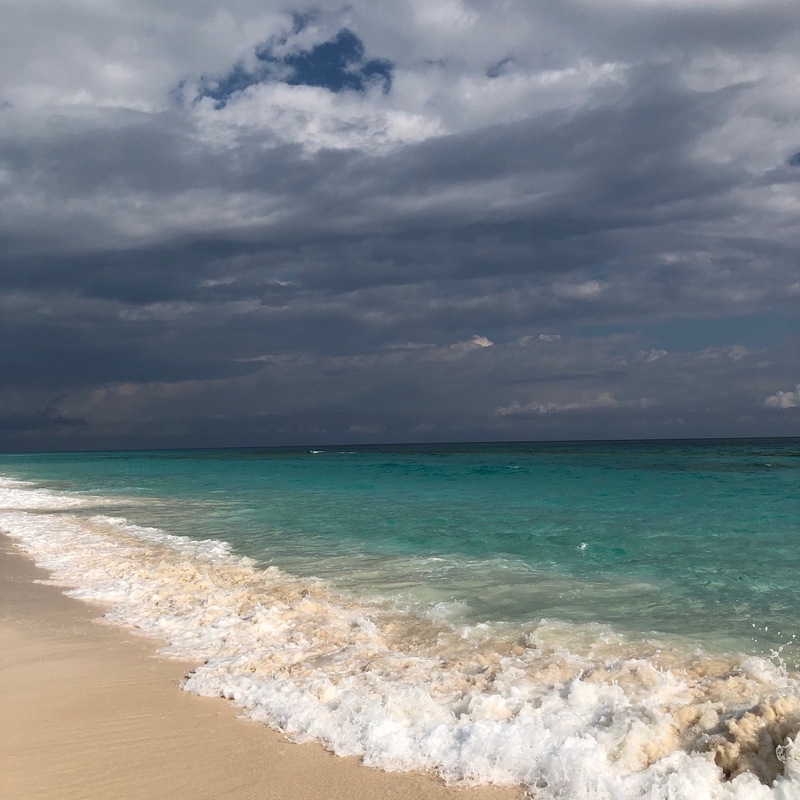 This time we turned and ran north all the way to Highbourne Cay (distance made good: minus 10 miles) so we could access the internet, get a long-range weather forecast. And let our friends, who were flying into Georgetown, know that we wouldn’t be there. They’ve rebooked their flight, and will meet us in Staniel Cay in a few days, a mere 40 miles south of Highbourne, as that proverbial crow flies. The trade winds are finally easing a little. We’ll try again this morning, tacking all the way. We’re older now, sure, but still running against the wind. We woke this morning to find the water in the sandy bay just off Gregory Town in Eluthera where we were anchored absolutely flat. Seriously. I mean flat. “Come see this!” Chris called. He was above deck, wiping the dew off the windows, I was below, making coffee. He pointed to a big stingray, flapping lazily by the boat. Oh, there’s conch. And a starfish. And what’s that weird-looking thing? Heh heh. It was our anchor, dug firmly into the soft sand. We’re back in the Bahamas, as you’ve probably gathered, and winter is now just a dim memory. 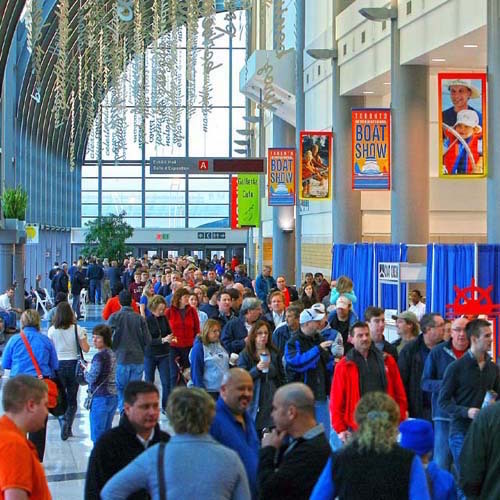 The boat show was so much fun—who knew so many people were interested in sailing across the ocean, or at least talking about it? Our seminars were well attended and there were lots of questions, and our time in the Nautical Mind bookstore’s booth just flew by. So many interesting people, including a young girl who sails with her father and wants to write a book. I really enjoyed talking to her. But here’s my greatest accomplishment: I sold a book to a blind woman. Okay, it’s not as impressive as it sounds. She had come to the boat show specifically to buy my book (very flattering!) which she was going to have read onto a CD so she could share it with her… wait for it… blind sailing friends. Turns out she’s a member of Blind Sailing Canada. Who knew such a thing existed? I think she’ll enjoy the section in the book that describes my brother John, who was pretty much blind by the time he was 30, going sailing with my dad. You can read that excerpt here. Even more tempting when people send us pictures of what it’s like in Canada right now. Thanks, by the way. They really cool us down on these hot, windless days.